Fill in the application form, sign it digitally and email it to teenindus@energia.ee. If you can't sign your application digitally, please attach a copy of your ID to the application. You must have a valid network contract before you can sign an electricity contract. Once you have a network contract, you can choose a suitable electricity seller and sign an electricity contract. The network contract must be signed with the network operator that covers your place of consumption. If your place of consumption is in an Elektrilevi network area, you can sign a network contract in the e-service of Elektrilevi. When will the electricity contract come into force? An electricity contract generally comes into force from the first day of the month, and it must be signed at least 21 days before the beginning of the month. This means that if you want the contract to come into force from 1 September, you need to sign it on 10 August at the latest. The exception to this is if you are signing a new network contract, because if you sign the electricity contract on the same day as the network contract, both contracts will come into force from the same day. So if you sign the network contract and the electricity contract on 15 August, both will come into force together on 16 August. Clients who have not signed an electricity contract with an electricity seller are buying the universal service. The universal service is available to all residential and business customers who have a main fuse of up to 63 A at their place of consumption, and to apartment associations. Eesti Energia sells electricity to customers of Elektrilevi as a universal service. If you no longer wish to buy electricity as a universal service, please sign an electricity contract with Eesti Energia. If you wish, you can authorise someone to sign an electricity contract on your behalf. There are two types of authorisations for signing a contract. You can authorise somebody else to sign a contract for all your places of consumption or for one place of consumption. To authorise another person, please log into the e-service and choose the authorisation type and the person you are authorising. You can only change your electricity seller once in a single month. The process will take up to 21 days and will enter into force when the next calendar month starts. If you want to terminate a contract concluded with another electricity seller and sign a new contract with Eesti Energia, please log into our e-service using your ID card or Mobile ID and sign a contract. Final prices for all packages may differ from the current offer. The exact price of the electricity package offered to you will be available after we have terminated your electricity contract with your current electricity seller. We will contact you to discuss the duration of your new electricity contract and the price we can offer you. In your existing electricity contract you can change the package, the length of the contract, whether you use Green Energy or a combination of various sources of electricity, and whether the price is based on a 24hr rate, day and night rates or an hourly rate, if your meter allows. A month before the end of your electricity contract we will send you an offer for a new price at which we can renew your contract. If the offer is acceptable to you, you need not do anything, because the contract will be renewed automatically. You will have 14 days to terminate a contract signed in the e-service or over our customer service line, so it is quite safe to sign a contract immediately. To terminate a contract, please log into the e-service and choose the contract you want to terminate. To change the contract, please log into the e-service and choose the contract you wish to change. What should I do to terminate a contract? To terminate an open-ended electricity contract, you need to apply for the contract to be terminated at least one month before the date you would like to end your contract. You can submit the application in our e-service or by sending us an application you have completed and signed on paper. Please note that the new contract normally comes into force on the first day of the month. If you do not wish to pay for electricity from the universal service price list in between your two contracts, we recommend you set the last day of the month as the date the contract will end. You can set any date for ending the contract if you do not mind paying for electricity from the universal service price list in between your two contracts. What is important is that you submit your application at least one month before the termination date you have given in the application. Do I have to pay for termination? Business customers may be charged a premature termination fee if the contract is a fixed-term contract. This affects Fixed and Combined packages where we have agreed to fix your electricity price fully or partly. The premature termination fee is different for each customer and depends on how long before the end date you wish to terminate the contract. You will not have to pay the fee if you terminate the contract on the date agreed with us or if the network contract ends at the same time as the electricity contract. You will find more information in the standard terms and conditions of Eesti Energia's electricity contracts. To terminate an electricity contract, please log into the e-service and choose the contract you wish to terminate. What will happen to my electricity contract if I move from the address of the place of consumption? We recommend that one of your first steps when moving house is to terminate your network contract. You can terminate your network contract with the network operator or their authorised representative. The electricity contract will be ended at the same time as the network contract. You don't have to contact us to terminate the electricity contract. We would still like to remind you that business customers may still have to pay an extra fee for terminating an electricity contract prematurely. What should I do if I have purchased a new place of consumption and would like to sign an electricity contract for it? We recommend that your first step should be to sign a network contract with the network operator that covers your place of consumption or with an authorised representative of that network operator. You must have a valid network contract before you can sign an electricity contract. We recommend you sign the electricity contract on the same day as the network contract so that both contracts come into force from the same date. You can sign the electricity contract later as well, but please remember that in this case the electricity contract will come into force from the beginning of the month and that it must be signed at least 21 days before the beginning of the month. You will be buying electricity at the universal service price or the balancing energy price before the electricity contract comes into force. With the Equal Package, your electricity price is fixed and regardless of consuming more in one month and less in another, you will be billed the exact same sum for electricity. The equal payment includes both the payment for electrical energy as well as the network service. The amount of the equal payment will be personally tailored to you, taking into account your estimated twelve-month consumption. it is a new consumption site on which we have insufficient consumption data. In such case we are not able to estimate the precise equal payments. However, we advise you to still conclude the agreement right now – the equal payment will be applied automatically when the consumption history of the site reaches six months. Before reaching six months, you will pay based on the traditional cents/kWh system. 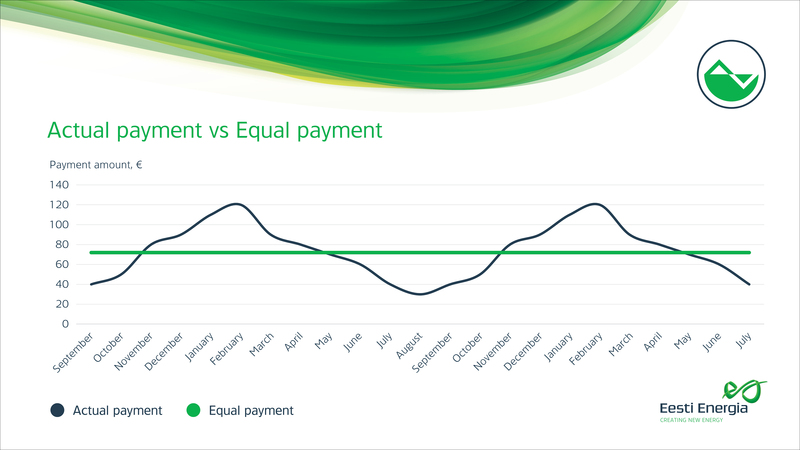 In six months at the latest, when all the conditions have been met, we will calculate the equal payment and change the billing automatically. We will notify you by e-mail or text message. we have no data on the network package of the consumption site. You can conclude the agreement immediately and the equal payment is automatically applied after we have issued the first invoice to you. During the first month, settlement will be handled on the traditional cents/kWh basis. the client has outstanding invoices. You can conclude the agreement immediately and the equal payment is established and applied automatically when all of the invoices have been paid. the consumption is too low to determine the equal payment. You can conclude the agreement immediately and, should your consumption increase over time, your equal payment will be established and applied. Until then, settlement will be handled traditionally based on the monthly consumption. Eesti Energia is the only one in Estonia offering a package with equal payments, which includes the cost of electrical energy in the network area of Elektrilevi, the network service fee, renewable energy fee and electricity excise tax. If your network service supplier is not Elektrilevi, we can only offer the Equal Package to you in the extent of the cost of electrical energy. In addition to the equal payments, the package includes insurance for electrical appliances for the sum of EUR 1,500 and in the sum of EUR 100 for electrical works. If you want to use the insurance, upon logging in to the online service, go to the sub-page "Insurance", where you will find the forms you can use to start resolving the issue. If you have trouble logging in to the online service, you can also open insurance cases at the customer service of Eesti Energia. If the electrical appliances at your home are damaged due to unexpected and unforeseen external circumstances (e.g. thunderstorm, short circuit, overload, over- or undervoltage), with the Equal Package they are insured up to EUR 1,500. The insurance excess is EUR 50. In the case of a loss event, please have your appliance inspected by a repair worker and request a document from them stating the cause of the damage, cost of repairs and the market value of the device before the loss event. Then fill in the form on the sub-page of insurance in the online service and provide as detailed a description of the event as possible. After you have filled in the form, If Kindlustus, the insurance partner of Eesti Energia, will then contact you with the loss decision. If any damage to the electrical system at your home has occurred that needs repair or replacement (e.g. loss of power in one room or floor, socket or wiring burning out), select the subsection "Call electrician" in the insurance page in the online service and order electrical works from Eesti Energia with the form provided there to assist you or call 777 1545. Electrical failure insurance provided with the Equal Package covers up to EUR 100 from the cost of a visit by an electrician from Eesti Energia. The insurance excess is EUR 0. The amount of the equal payment will be personally tailored to your home, taking into account your estimated twelve-month consumption. In the end, you will never be paying any more or any less for electricity than you have actually consumed. We will monitor it for you to ensure that the difference between your equal payments and actual electricity used does not become too large. If this happens, we will change the equal payment in the course of the year and notify you of it. We will never use set-offs during the validity of the contract period. As a client, you can view your consumption balance, that is the comparison between the equal payments and the actual consumption in the online service of Eesti Energia. When you terminate the electricity contract, we will refund the excess sums paid as prepayments, that can be transferred to your bank account, or will claim the outstanding sum from you as the last payment. You can see all your bills by logging in to our e-service. Eesti Energia makes out and forwards bills by the 12th of each month at the latest. Billing time depends on the date on which network operators (incl. Elektrilevi) send us consumption data, which is why the bill may not reach your mailbox on the same date each month. If you are in doubt, whether your bill has been issued or not, you can easily check your bill from our e-service and mobile app. Eesti Energia does not issue bills with the amount less than 3 euros. In the interest of sensibility and sustainability, we have set a minimum rate to bills, which gives you an opportunity to pay your bills summed up only when the total amount is more than 3 euros. You can change your billing address in our e-service. The bill has been sent to junk folder. Please check your mailbox settings. Antivirus program may have destroyed all e-mails containing a file in PDF format. Your mailbox limit of e-mails may be exceeded. We recommend deleting old and unnecessary e-mails. You can view all your bills and download them again, if needed, in our e-service. If you are the customer of Eesti Energia electricity service, we send you both electricity and network service fees on the same bill. If you are the customer of Eesti Energia gas service, fee for consumed gas energy is reflected on the bill, but the bill for gas network fees will be delivered to you by your gas network company. Electrical energy bill without network service is only delivered to customers that are not located in Elektrilevi's network area, i.e. the place of consumption is located in the area of some other network service provider. Electricity bill sent to you is divided between three cost items: electricity service, network service and state taxes and fees (renewable energy fee, electricity excise tax and turnover tax). Electrical energy cost depends on the price of electricity in wholesale markets i.e. the exchange, customer's electricity consumption and the competition of electricity sellers. Turnover tax is added to the price of electricity. Network service price consists of electricity transmission and renewable energy fees, and electricity excise. Turnover tax is added to all fees and the excise. Electricity transmission fee is a fee for maintaining Elektrilevi's network and delivering electricity. Network service price is coordinated each year by the Competition Authority. Renewable energy fee is a state appointed fee, which aims to support electricity production from renewable sources or in an efficient co-production mode in Estonia. Renewable energy fee is calculated and disclosed each year by the main network operator Elering. Electricity excise is a state tax, which is used for funding environmental protection. Customers that have several places of consumption can order a summary bill, which can easily be paid with one payment. The bill summarizes the total consumption of all places of consumption. A summary bill can be ordered by calling our customer service number 777 1545 or in writing to teenindus@energia.ee. Consumption data on the bill is generally received by remote readings based on actual consumption. The customer does not have a remotely operated meter and the customer has not forwarded any readings. In case of a remotely operated meter, data communication is disturbed or the main switch has been switched off by the customer. If the remotely operated meter is not able to forward readings due to a data communication error, consumption data is saved to the customer's meter on an hourly basis. When data transfer recovers or the customer sends us actual readings, we will recalculate the predicted periods. Recalculations can be found on the second page of the bill. For the fixed payment to function, we ask you to order e-bills with the reference number on the bill and formalize an e-bill fixed payment contract. Orders can be formalized in your internet bank or bank office. The reference number is important when paying the bill because it links the right payment to the right bill. When paying using a wrong reference number, you may run into unwanted debt. Your reference number is located on the first page of your bill. The payment deadline for bills is 14 days from making out the bill. It is possible to order a reminder about the payment deadline becoming due in our e-service. When paying a bill via a bank link, the boxes are conveniently pre-filled. Bills can be paid in cash in post offices (service fee according to Omniva price list applies) and bank offices (service fee according to the bank's price list applies). Payment made from a different bank (e.g. from SEB to Swedbank) is received within up to two business days. Payment made from a post office is received within up to five business days. Payment receipt can be checked in our e-service. A bill unpaid before the payment deadline is added by fine for delay for each day exceeding the deadline. Current rates for fines for delay can be found from the standard terms of the corresponding product or service. In case a prepayment should occur, we automatically take that amount into account when making out the next bill. Please log into the e-service to submit readings to Elektrilevi. If a remotely operated meter has been installed to your place of consumption and it is connected to our information system, you don't need to report your reading. In this case, the readings reach the network operator automatically by the remotely operated meter. If you do not have a remotely operated meter yet, you need to report you electricity meter reading to the network operator, whose area your place of consumption is at. Based on the readings, the network operator calculates your electricity consumption and transmits the data to Elering's data storage. Based on the info sent to the data storage, electricity sellers make out the bills. If your place of consumption is in the network area of Elektrilevi, you can report the reading both by Eesti Energia and Elektrilevi e-services. More precise info about reporting readings can be found from Elektrilevi's home page. You can authorise somebody else to manage all of your contracts, whether for one place of consumption or for several places of consumption. Please note! You can only authorise a person who has already registered in our customer information system. If they have not done so, they must first register as a customer using our e-service. You can also send your letter of authorisation by email or by post, filling in the letter of authorisation form and sending it to us. Companies that have not used our e-service before should first of all send us an application so we can register the company as an e-service user. The application can be submitted by any representative of the company who has the right to delegate powers, such as someone who is named in the company registration in the commercial register. The digitally signed application can be e-mailed to teenindus@energia.ee, or a signed paper copy can be sent to us by post. If you cannot sign your application digitally, please attach a copy of a valid ID document to the signed application. After becoming an e-service user, the representative of the company or institution will be able to authorise third persons to manage operations in our e-service. The universal service and balancing energy are used by electricity consumers who do not have a contract with an electricity seller. In this case, electricity is sold by the network operator or their authorised electricity seller. In the open market, residential and small-scale business customers with a main fuse rating of up to 63 A who have not signed an electricity contract use the universal service. The Electricity Market Act does not allow network operators with more than 100,000 customers to sell electricity, instead they have to appoint a licensed electricity seller. Elektrilevi has appointed Eesti Energia as its electricity seller. The Competition Authority checks the pricing of the universal service retroactively. The price for the universal service changes every month depending on the exchange price and so the price for the previous month's universal service will be known by the 9th day of the month at the latest. The price for the universal service depends on whether the consumption point has a single or dual tariff meter according to the network contract. The universal service uses 24-hour rates, day rates and night rates. The price for the universal service is made up of the weighted average wholesale price with the sales margin for the universal service and VAT added. The price for the universal service is based on the day-ahead market exchange price, to which sellers of the universal service add their sales margin. Although the power exchange uses the arithmetic means of days and months, all users of the universal service buy electricity at a price based on the weighted average of the electricity price. What is the difference between the arithmetic mean price and the weighted average price? The arithmetic mean and the weighted average price of the universal service are two slightly different things. The weighted average exchange price reflects how much electricity costs on the power exchange at certain times and how much electricity customers of universal service consume at those times – this is calculated 24 hours a day, 7 days a week. With a two-tariff package, separate average prices for day and night consumption are calculated. To calculate the weighted average, electricity sellers use the quantities of the universal service consumed, data on which is sent to them by the network operator. Users of the universal service can sign an electricity contract at any time at no extra cost. For a contract with an electricity seller to come into force from the beginning of a month, it must be signed at least 21 days before the month begins. If you are a business customer (except an apartment association) with a main fuse rating of higher than 63 A and you do not choose an electricity seller in the open market, then the network operator responsible for the area of your consumption point will sell you electricity at the price of balancing energy with a sales margin added. It is not possible to forecast the price of balancing electricity. Balancing electricity works like a forecasting error. It is the electricity needed to cover shortages in the electricity system of Estonia or the excess electricity in the system in each hour. The price of balancing electricity depends on the demand for it. The more customers there are who do not choose a seller, the higher the demand for balancing electricity will be, and thus the higher the price. It is possible that there will be times when there is an excess of electricity, which will make the price of balancing electricity go down. Elering, the transmission system operator, is responsible for calculating balancing electricity. In an open electricity market, a contract with your chosen electricity seller lets you avoid the need to buy balancing electricity. If you have not signed a contract with an electricity seller and your consumption point is in the network area of Elektrilevi, you will be sold electricity by Eesti Energia, which is Elektrilevi's appointed electricity seller. Eesti Energia's sales margin of 1.78 euros (not including tax) per MWh was added to the price of balancing energy in May 2016. In a network contract you and the network operator will agree on the conditions for supplying electricity to your place of consumption, the network service price package and the contact details for sending important information. Outages can be due to breakdowns or they can be scheduled. A breakdown means that an outage occurs unexpectedly after an extraordinary event in the power network. Breakdowns are usually caused by trees that have fallen on the power lines, damage done to cables during construction work, or failures in old network equipment. The purpose of scheduled outages is to repair and maintain the electricity network and to build new networks. Sometimes lines have to be disconnected to allow for the transport of bulky cargo. The network operator will give prior notice of scheduled outages. You will receive detailed information from the network operator in your area. Sometimes work is necessary on the electricity network, in which case you have to contact the network operator of your area. We primarily need customer data so that we can fulfil our contract agreements with our customers for the sale of electricity and provision of network services, and so we can offer new services from companies of the Eesti Energia Group such as electrical work and energy audits, and also because we have a legal obligation to do so, for example to pass on customer data to investigative authorities. While we are doing our work under a contract or having that work done by someone else, Eesti Energia AS handles customer data in accordance with Art. 14(1)(4) of the Personal Data Protection Act. According to this provision, no customer's consent is required for the processing of personal data. According to Art. 15(2)(2) of the same act, no additional notification needs to be given to the subject of the data about the processing of the data, as all the data were received from this particular person, who is consequently aware that the data are being processed. Eesti Energia sends customers third party information, including advertising, only where the prior consent of the customer has been received. Customers have the right to review their personal data in our possession by logging into Eesti Energia Interactive. Where the customer data have changed or are no longer valid for other reasons, customers must immediately advise us of this by calling our customer information line or sending us an email message. The customer has the right to demand that processing of his/her personal data be terminated or that the collected data be deleted, where such a right is granted in the provisions of the Personal Data Protection Act or any other legal act. If you wish to learn more about the processing of your personal data, call our customer information line +372 777 1545 or send us an email message to teenindus@energia.ee. We collect only the minimum information about our customers that is necessary, exactly as much as we need to do our work. Access to customer data is only permitted to those members of staff whose jobs require them to have access to such data and only the data needed for specific tasks is processed. The companies that work with us in data processing, such as mail delivery and print shops, must adhere to our data safety rules. The contracts we have with such companies contain confidentiality clauses about this.